There are several findings about labor mobility that are now roughly undisputed among economists. For this series of two blog posts, of which this is the first, I am drawing on the existing and new work of my CGD colleague Michael Clemens (with co-author Professor Jennifer Hunt), my Harvard colleague Professor George Borjas, as well as other eminent scholars David Card, Giovanni Peri, and Vasil Yasenov, who have helped define our understanding of this important policy area. First, that there are massive wage gains to workers moving from developing country to developed country labor markets (on the order of PPP adjusted $15,000 per year per low-skill worker) is now one of the most robust facts in development economics. This magnitude of wages gains, which imply workers would increase their average earning by roughly a factor of four, is consistent with observational data, econometric comparisons of equivalent workers across labor markets and adjusting for selection, occupational data, randomized experiments, and macroeconomic data. The per worker wage gain of labor mobility from developing to developed labor markets dwarfs all other income/earning interventions. Producing sustained gains of 10 to 15 percent from (costly) programmatic interventions is considered very successful, compared to the wage gains from mobility in excess of 400 percent. Second, on net, there are economic gains to reducing barriers to labor mobility. As with nearly all border-based restrictions that prevent a willing domestic actor from carrying out a mutually voluntary economic transaction with a willing foreign actor, there are net positive gains from unilateral reductions in barriers. All partial and general equilibrium estimates of the net GDP (wage plus capital income) show gains to the United States. These are perhaps not large, but they are positive. Recent work from the IMF suggests positive gains for richer countries from both low and high-skilled migrants—and not just limited to the richest, with gains to the bottom 90 percent. The number of foreign-born in the United States has increased from 24.5 million in 1995 to 42.3 million in 2014—an increase of 17.8 million people (p 2)—and yet the scientific consensus is that the wage impact is “very small” (and “very small” could be positive, negative, or zero). The question about the impact of low-skill migrants from developing countries on narrow groups of native workers who are close substitutes for the newly arrived is a hot topic again as several researchers have revisited the experience of the Mariel boatlift. This experience gets attention because identifying the causal impacts of migration is very hard. The Mariel boatlift is widely regarded as providing a near-ideal “natural experiment,” as the movement of Cubans to Miami was (a) exogenous to economic conditions in sending or receiving places (driven by politics of US-Cuban relations), (b) short and sudden (the movement lasted only six months), (c) concentrated initially on a single local labor market, and (d) large relative to that market in that it added about 7 percent to the labor force (and almost 30 percent to the labor force with less than a high school education). 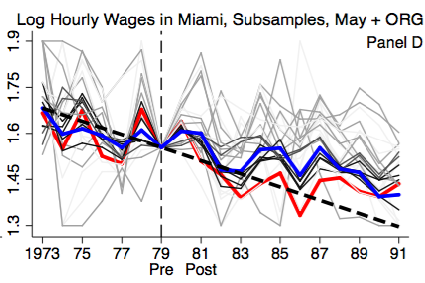 Comparing the evolution of wages and unemployment between Miami and other US cities for various groups of workers in the period just before and after the Mariel boatlift is an obvious and natural way to look for the impact of migration on the employment and wages of natives, particularly of super low-skill natives. The original 1990 paper by David Card was striking and remains influential as he found no impact on low-skill workers in Miami: not on wages of those with high school or less education, not on unemployment, not on minorities (e.g. non-Cuban blacks). George Borjas, a member of the NAS report panel and HKS colleague of mine, has a 2015 paper on the Mariel boatlift experience arguing that, although the large and rapid influx of migrants did not affect average wages and did not affect low-skill wages, defined in the usual way as those with high school education or less, a small, demographically arbitrary, group—which I call the BSG (Borjas sub-group)—experienced large negative wage impacts. The BSG is “male, non-Hispanic, less than high school educated, workers aged 25-59.” In this blog post I want to address two technical points about this finding and then address more conceptual points about the policy implications of this general type of finding of distributional impacts in Part Two. 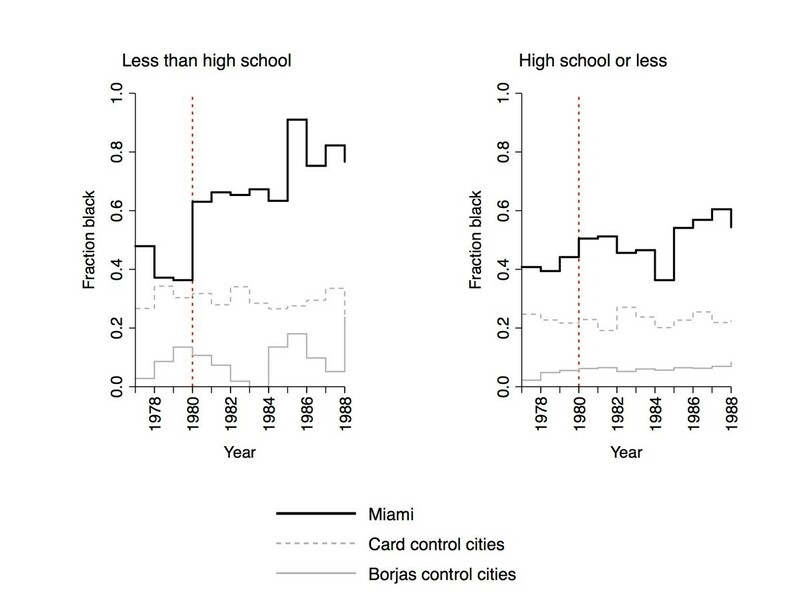 The first technical point is that a recent paper by Clemens and Hunt (2017) (and two blog posts by Clemens (one and two)) have shown (Figure 1) a substantial rise in the fraction of blacks in the BSG in Miami (from 40 to 60 percent or more), a rise that was driven by political pressure on the Census that they were undercounting minorities. They show evidence that, combined with the fact that blacks on average earned less in that category, this shift in the composition of the BSG fully accounts for the Borjas finding. Source: Clemens and Hunt 2017. Borjas responds in his blog post that his results go through even excluding blacks showing a graph with massive falls in wages in Miami in 1985 to 1987 of the BSG versus all other cities in the March CPS. But, as the Clemens and Hunt (2017) paper shows (Table 1), the number of whites in the March CPS sample in the BSG in 1985 was two—not two percent, or two of a thousand but literally two people in the way that you and me, dear reader, make up two people. In 1986 it was four people; in 1987 three people. While I am convinced by the Clemens and Hunt arguments that the sample composition shift does account for the BSG result, even if Borjas is right, the main point is that the BSG is small in the CPS sample precisely because it is small in the population. Only 4.4 percent of the male, non-Hispanic, aged 25-59, employed population in the March 2016 CPS had less than a high school degree. The BSG itself is only 1.4 percent of the employed in the United States. Source: Author’s calculations with https://sda.cps.ipums.org using March sub-samples. The second technical point is from an even more recent paper of Peri and Yasenov. They analyze the Mariel experience with better methods and basically reproduced the Card 1990 result of no impact. Moreover, they explicitly show that the BSG results are not robust and that, even if one limits oneself to impact on the very low-skilled, the data say there was no negative impact on wages. If one looks at the BSG there are two features that stand out. One, by focusing only on those with less than a high school education this is not the labor market “low skill” but “super low skill.” Two, the intuitive notion of looking for a group whose wages might have been negatively impacted, as expressed in the NAS report paragraph above, is to choose a group that is the “closest substitute for new immigrants.” On this score, the BSG looks strange. Why exclude Hispanics? It would seem that newly arrived Cubans would be a very close substitute for Hispanics. Why choose only those older than 25? Over half of those with less than HS aged 20-25 are employed and early entry workers might be close substitutes for newly arrived Cubans. Why only men? About 40 percent of Mariel arrivals were women. Peri and Yasenov’s Figure 8 shows the evolution of wages in Miami for the BSG and 26 other, equally intuitively plausible, demographic groups of individuals with less than high school education. The BSG is in red, Peri and Yasenov’s preferred subgroup is in blue, and the other 25 group definitions are in shades of gray with darkest gray those with 40+ observations, light gray with 20-40 observations and the lightest gray for those with less than 20 (the BSG had on average only 19.4 observations in the March CPS and 47.4 in the May-ORG data in the 1978-82 period). It is visually obvious that nearly all groups of less than HS have wage performance much, much better than the BSG and in fact, the BSG has the lowest or next-to-lowest wages of all the sub-groups from 1983 to 1987. Source: Peri and Yasenov 2017. Put another way, to put reliance on a particular empirical finding is good if the finding is robust to minor, plausible variations in empirical approach—like whether young workers are or are not included, whether women are or are not included, Hispanics are or are not included. The Borjas findings are, in this sense, the opposite of robust. Many demographic subgroup definitions of those with less than HS show wages in Miami well above the 1973 to 1979 trend line for most of the post-Mariel period, including all of those groups with the largest samples. As an analogy, imagine you flipped a fair coin 270 times. But then, instead of taking the average over all 270 flips you divided the flips into 27 groups of 10 and tested whether the point estimate of Prob(Heads) = 0.5 separately for each group. The odds are about 80 percent that you would find at least one group that rejected the null hypothesis of a fair coin. But reporting the findings of only one of the 27 groups of coin flips as if the usual statistical procedures about point estimates and standard errors and statistical significance apply to that group as if the small group was a random sample is, at best, an egregious misuse of statistics (at worst, it is disingenuous data-mining). (And these two technical points are inter-linked as with groups with samples larger than the BSG the shift in sample composition noted by Clemens and Hunt is less likely to have had a big impact as the groups were bigger by including women and men, Hispanics, and a broader age of worker). There are two takeaways. First, no one, not even Borjas, is arguing that a massive, rapid, influx of mostly low-skilled workers into Miami lowered average wages, or even wages of those with high school complete. The debate is only about whether a very small slice of the US employed labor force (4.4 to 6.2 percent)—those with less than HS—was negatively affected. Second, both the Clemens and Hunt (2017) and Peri and Yasenov (2017) papers are able to first replicate the wage result on the BSG but then show two different reasons this single empirical finding for the BSG is highly unlikely to represent the impact of an influx of low-skill immigrants on wages even of the super low-skill employed in general. The twin facts of shifting composition with the BSG and the lack of robustness of the finding for equally plausible demographic groups give very good reasons to believe that Borjas’s reported findings are, at best, a fluke (at worst, they are the result of data-mining but I am not arguing that). That is, the most likely interpretation of Borjas’s reported findings is that the point estimates are what he claims they are, but any claims for “statistical significance” of his findings are severely strained and his results are much more likely to be the natural consequence of there being large variations across apparently minor choices of method when samples are small and variances large. It seems the strongest case that Borjas can make at this time is that the point estimate results on the BSG itself have never been overturned (again, both Clemens/Hunt and Peri/Yasenov can replicate the findings)—though the “statistical significance” cannot be defended. But the Peri and Yasenov (2017) results imply that the BSG cannot be taken as representative of “all less than HS educated” workers (who are only 6.2 percent of the native born employed) but only of those who meet the BSG criteria within that already small slice of the labor force. Borjas’s reported impacts on the BSG cannot be taken to apply to women, to Hispanics, to younger or older workers. The BSG as a fraction of the 2016 employed in the USA is only 1.2 percent. Here is Borjas’s best possible empirical case: (a) there were generally positive impacts for movers, (b) there were gains for the economy at large, (c) there were, at worst, no losses for low-skill workers generally (and might have been gains for HS educated), (d) there was no evidence of robust negative wage impacts even for super low-skill workers but (e) there is some evidence of negative impacts on the BSG, a small subset of the super low-skill (whose statistical significance is extremely hard to assess). Part Two examines the policy implications of that interpretation of the empirical evidence.